Don't you love this time of year? The leaves are changing colors, the air is crisper, everything is pumpkin-flavored and, perhaps the best perk, Thanksgiving TV episodes start to roll out. Naturally, you'll want to clear your viewing schedule on actual Thanksgiving week to watch this year's new additions to the holiday episode collection. But what about all of your favorites from Thanksgivings past? Well, we're glad you asked. We, too, are obsessed with all things Thanksgiving and wanted to do a little pre-gaming prior to Turkey Day. This means streaming a variety of T-Day TV classics from the comfort of our own homes. Really, what could be better, right? So, pull on your fuzzy socks, get cozy on the couch (preferably with a hot pumpkin-flavored cuppa something) and kick back with hours upon hours of scenes so classic they deserve their own floats in the Macy's Thanksgiving Day Parade. In full disclosure, this episode wasn't without controversy. The storyline, centered on a Native American demon spirit, was culturally insensitive to say the least. However, it remains a favorite among fans for a few reasons — namely, Spike (James Marsters) and Angel (David Boreanaz). 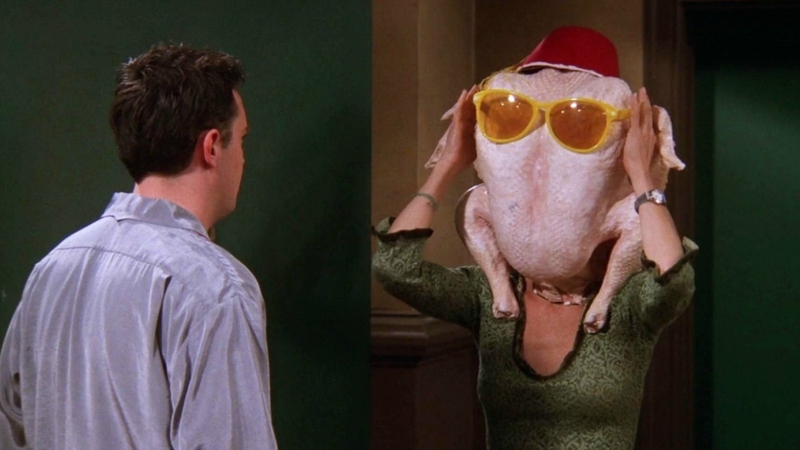 Friends, "The One With All the Thanksgivings"
Could this episode be any cooler? To be clear, there are far too many amazing episodes in Friends history to choose just one. This one is filled with hilarious flashbacks of '80s Monica, pre-nose-job Rachel, Flock-of-Seagulls-coiffed Chandler and lovesick Ross rocking a questionable 'stache. If we had to choose a second place episode in this category, it'd probably be "The One Where Ross Got High," aka the time Rachel made her infamous meat trifle. How I Met Your Mother, "Slapsgiving"
And a hallowed new holiday tradition was born! In this episode, the "slap bet" has evolved far beyond its original scope and transformed into "Slapsgiving." We must admit, we'll always be thankful that we can watch Marshall, Ted and the gang torture Barney with anticipation. Gilmore Girls, "Deep-Fried Korean Thanksgiving"
If we're really being honest, every holiday episode of Gilmore Girls was the best episode ever. But in narrowing it down, this particular episode stood out. Why? 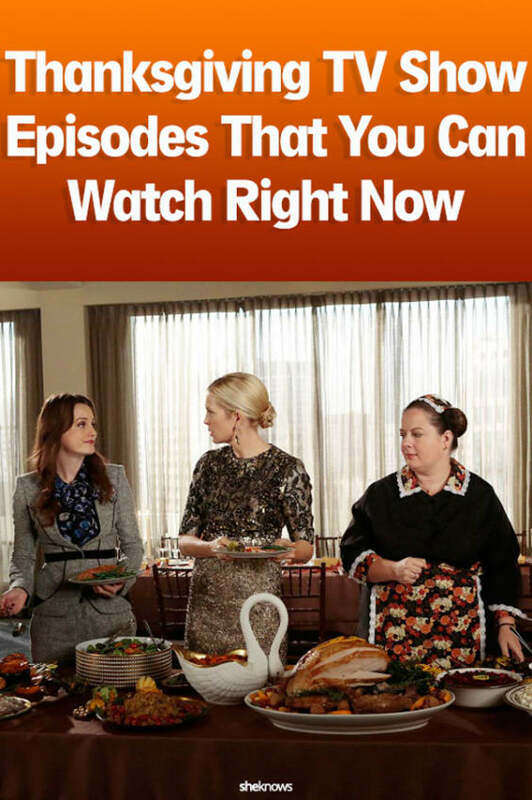 We got to watch Lorelai and Rory attempt to cram four Thanksgiving dinners into one day. Plus, adorable Adam Brody (as Dave) officially started wooing Lane. Although that romance didn't last, it was cute to watch unfold. Gossip Girl, "Blair Waldorf Must Pie!" OK, OK. We'll admit this isn't exactly the most heartwarming holiday episode on the list. It's basically one big drama-bomb after another, in fact. The truth comes out that Lily and Rufus used to date, sending Dan and Serena into a weird "ew, should we be dating?" spiral. With her and her dad's pie tradition hanging in the balance, Blair revisits her troubled past. Nate's dad takes too many pain pills and winds up almost dying. But if you're a loyal fan of Gossip Girl, you know all of those moments were pivotal to the growth of the characters. Besides, that's just kind of how GG rolls. Bob's Burgers, "An Indecent Thanksgiving Proposal"
If you like holiday episodes that are a bit subversive, this is the one for you. In this episode, the Belcher family's landlord, Mr. Fischoeder, offers to float them five months on their rent payment if they pretend to be his family to make a woman jealous. Of course, they say yes, and comedic disaster ensues — including Bob getting wasted on absinthe in the kitchen and talking to the turkey. Seinfeld, "The Mom & Pop Store"
Elaine can't hear anything. George is criticizing the iconic parade floats. Kramer steals all of Jerry's shoes. And they're all milling about a party, being their typical quirky yet lovable selves. Did we mention that it also cameos a young Bryan Cranston as dentist Tim Whatley? That alone is worth streaming for. While what happened between Ryan and Marissa during this holiday-themed episode was much more important in the grand scheme of the show (spending time in his hometown forces her to face her privilege), we can't help but be obsessed with Seth's storyline. In trying to be a player, he bungles things big time when his two love interests, Summer and Anna, nearly run into each other in his parents' kitchen. Awkward! Boy Meets World, "Turkey Day"
Like Marissa's trip to Chino in The O.C. 's Thanksgiving episode, "Turkey Day" on Boy Meets World fostered an important conversation about classism. How? By taking Cory out of his comfortable, white-picket-fence suburban family life and placing him and his family in the trailer park with Shawn and his family for the holiday. Suffice it to say, it's a must-see. This episode kicks off with control-freak Claire agreeing to let Phil and Luke cook the turkey, so you just know shenanigans are in store. No way, no how is Claire going to be able to kick back and relax for that — and, true to form, she cooks her own backup turkey. When she inadvertently blows a fuse box in the garage, cutting power at their house, they decide to move the dinner to Jay and Gloria's while Jay and Gloria are supposed to be in Mexico. Surprise! They're not. Secrets, lies, suspicion, meltdowns… yep, sounds about right. The West Wing, "The Indians in the Lobby"
This is West Wing, so you know it's gonna be razor-sharp with biting wit. In this cheeky episode, there's a lot going on, but here's all you really need to know: At one point, President Bartlet dials the Butterball Hotline, which sends his staff scrambling to protect his true identity after he calls himself Joe Bethersonton of Fargo, North Dakota. When Laurie brings home a friend for Thanksgiving, family dinner starts to go awry fast when that friend can't stop flirting with Eric. So, they're understandably distracted as dinner gets underway, but Kitty can't shake the nagging feeling she left something off the table. Only then does it dawn on her that she forgot to pick up Red's mom! Any episode that ends in a food fight is a win in our book, and this one is a true classic. Although Carla has the best of intentions when she invites the whole gang over for a Thanksgiving potluck, it doesn't take long for everything to start falling apart. Hence, food fight. Will & Grace, "Homo for the Holidays"
When Will and Grace find out Jack never told his mom he's gay (and, in fact, she thinks he's been romantic with Grace), the pair invite her to Thanksgiving in an attempt to get Jack to open up. But Mommy Dearest has a surprise of her own that will catch all of them off guard.